There’s nothing like packing up a few essential supplies into the car and escaping to the great outdoors. But now that the family is growing, the need for space increases. Travel trailers are a great alternative to the, sometimes bank-breaking, full-sized motorhomes. They are also more flexible when you want to go exploring, but don’t feel like packing up a whole RV. Not to mention, a little safer when traveling with kids. So now the question is—how do you select the right travel trailer for your family? Well, you’re in luck today, as we’re going to provide you with some points and tips to consider before choosing a trailer. Let’s get right into it! 1. How Much Sleeping Space Do You Need? After long days of hiking, fishing, swimming, or just playing around the campsite, kids are going to get tired. Children, whether small or big, bring your passenger count up, meaning you should look into a larger trailer. Of course, if you’re used to bed-sharing or bunk beds, you may do just fine with one or two sleeping options. However, for older kids, a private bed is a necessity. Let’s say you have three children. That means you must accommodate five people, including yourselves. You should also take into consideration whether you’re intending on expanding your family in the near future. For families, I always suggest buying a trailer with a more spacious floor plan. Of course, these are usually a bit on the pricier side. Still, you know there’s going to be enough room to get a moment—or bed—to yourself. Before you throw out your travel trailer dream due to the budget, there are options you can choose without going into debt. Expandable and pop-up trailers are great alternatives to a giant fifth-wheeler. These trailers are more compact in size. But, once you arrive at the campsite, they can expand to make room for an extra bed or a large living area. You can read more on these further down. Another option is a floor plan with pull-out beds, or convertible furniture. These alternatives usually have a bed hidden under the sofa or a table that can transform into a cozy double bed. If this just isn’t enough, you could always opt for bunk beds. We all remember them from summer camp. These are beds stacked on top of each other, saving tons of space. 2. How About A Bathroom? “I gotta pee!” is probably the catchphrase of your journey. As adults, we ‘e generally capable of holding it in for another 20 miles or so. Kids, however, have to go when they have to go, and as a parent, you know it’s not fair to ask them to hold it. Therefore, bathrooms are a must-have in your camper. Unless, of course, you’re traveling with older, or diaper-aged children. Not all campers have bathroom facilities. If you’re on a budget and won’t be traveling long distances without a pit stop, you might be fine without one. But even so, consider your children’s daily routine. Is a shower or bath included before bed? If so, you should probably look into a camper with similar functions. A toilet and sink are also essential features. Some children can easily get uncomfortable using the bathroom in unfamiliar surroundings. This, in turn, can lead to constipation or a urinary tract infection. Two things you don’t want to happen on your trip. Depending on the type of trailer you’re looking at, the types of toilet available will vary. Some smaller trailers may only have a porta-potty type of thing going on. Here you’re expected to empty the waste manually. 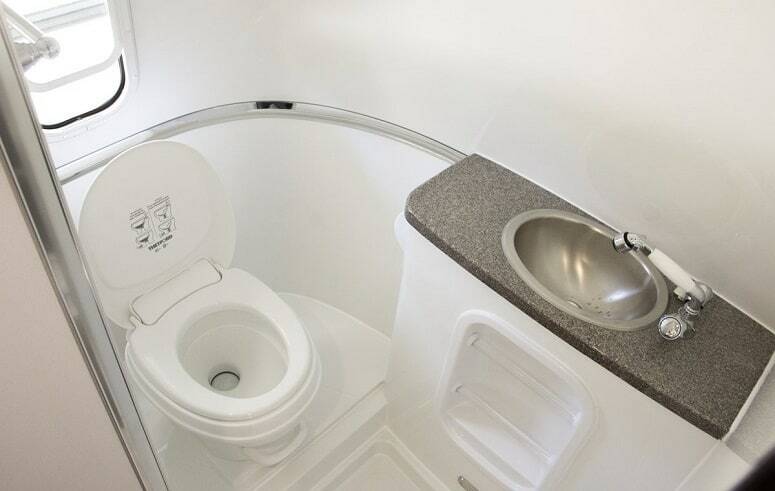 Larger campers often offer you an RV-like toilet. Usually within an enclosed bathroom. The waste will drain into a separate tank which is emptied from outside. These toilets have a seal at the bottom of the bowl, with a little water, preventing odors seeping into the trailer. My recommendation would be to find a camper toilet with a kitchen hose attached. After you go number two, it’s good to have some spraying water handy to get everything down the drain. Traveling with kids can quickly get messy, and you don’t want your camper reeking of sewage. If you have a larger family and a bigger budget, you could buy a trailer with two bathrooms. One for yourselves and one for the kids. This will add to the privacy and could give you some extra time in the mornings. So, unless you’re planning on parking next to a diner, or cooking over an open fire, a kitchen is a must. In campers, the kitchen usually sits at the back end. Depending on the type of trailer, there might be a microwave, hot plates, a sink, and some cabinets. Don’t forget about the fridge! In the great outdoors, supermarkets and convenience store aren’t always available to provide you with fresh groceries. Therefore, you’ll need a cold place to keep the food safe. Most campers do come with a small fridge and freezer, but you can always upgrade it if you need something bigger. However, avoid overloading the trailer. Consider what you’re planning to cook throughout your trip. Is it a Thanksgiving meal or a simple mac n’ cheese? Do you need much space for snacks and juice boxes? And how many utensils are you bringing? The kitchen is, after all, the most used space within the trailer. Food is usually the solution to cranky kids during a long trip. So it’s useful to have somewhere you can whip something together before hitting the road again. From the kitchen to the dining table—this is another essential when you’ve got kids on the trip. Having a place to sit down and chew their food properly will give the children a sense of home. Not only that, but it also provides a station where you can get together as a family. Some trailers do have a fold-out dinette which would be enough for a small family of three. But if you’re towing a bigger family along, this might be too small. In these cases, a budget-friendly option would be to bring a foldable table and chairs with you. This way you can set up the dining area pretty much anywhere. The only downside is that you’ll be sitting outside, even if it rains. If you’re on a bigger budget, larger trailers have kitchen nooks. This is basically a bench or U-shaped table, where there’s room for more people. Packing as light as possible, with only the essentials, is the name of the game when traveling in a trailer. But this is not always easy when you bring kids along. Younger children sometimes have personal items that they feel attached to. Older kids might feel the need to bring larger toys, tablets, or laptops with them. This all requires storage space. As a parent, you also understand the importance of packing extra clothing options, in case something gets wet. Not to mention the blankets and quilts needed to keep warm during the night. Go down to your trailer dealer and have a look around the inside of the camper. You can use pretty much any space as storage on the move, such as fold-aways, retractables, or other hidden areas. Once you bought your trailer, you can always get creative with some storage space hacks. Some examples are magnetic strips mounted on the wall, gliding drawers, and velcro remotes. Getting creative with these hacks might allow you to buy a smaller trailer and save some money. Growing kids sometimes results in tall bean sprouts once puberty hits. And since your new trailer should be an investment for future holidays, you’ll likely want to be able to accommodate the teenagers. Unfortunately, most travel trailers aren’t exactly known for having high ceilings. This often results in bruised foreheads. It can also make the space seem feel cramped if you’re hosting a larger family. Luckily, there are manufacturers who have acknowledged this issue and made a change. 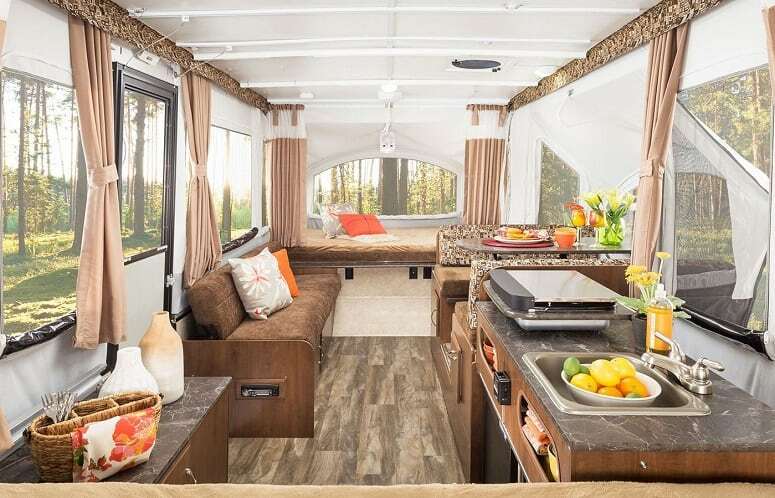 Travel trailers, like the Aspen Trail and Forest River, have high ceilings in most of their models. Also, these are generally larger overall, so you can easily accommodate more people. Tall ceilings will not only fit better with growing kids, but they will also make the inside space appear more palatial. Plus, you won’t have to risk getting a backache from ducking every time you go indoors. To save additional cash, skip the carpets. Hardwood floors are easier to clean, whereas carpeting can store food residue, which may attract an array of unwanted pests. Kids are messy; there’s no way around that. And that’s okay. But while on the road, you don’t want sticky juice or crumbs festering in the carpet. Once mice or cockroaches begin to invade your trailer, it might put your kids—and partner—off camping altogether. Children love their tablets, phones, and whatever else they are glued to these days. But this also means that there should be a sufficient amount of outlets to charge those dying batteries. As well as mom and dad’s phones, in case of emergencies. Everything in the travel trailer runs on batteries while you’re on the road. 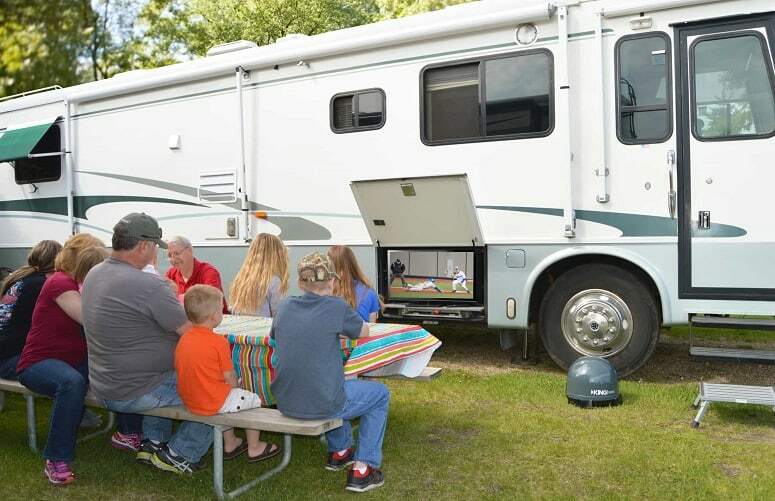 Consider how much technology your family uses and choose a camper with a suitable battery. Studies reveal that the average American spends around eight hours every day watching television. Hopefully, during your trip, the TV time will be shorter. But it might not be completely avoidable. Consider if a TV is something you will need in the camper. If so, you may need a trailer with a larger floor plan. Particularly if all the family is going to watch a movie together. Next step—get all the required cables and TV antenna. You can get an HDMI cable, so your kids can connect their games and devices to the television. There are, of course, travel trailers already fitted with everything you need for entertainment. However, these will bump up the price. When there’s no technology left to entertain your kids, the beautiful scenery should do. 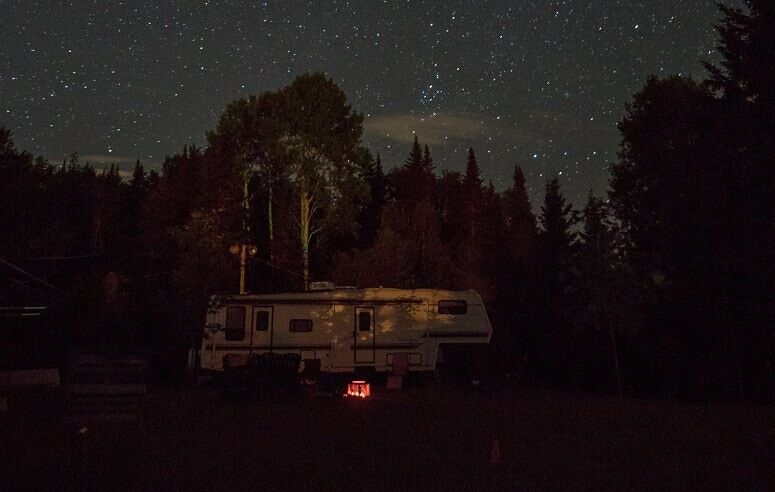 While most campers have windows, they are not always in places where your kids can enjoy the passing scenery. Choose a trailer with one or two picture windows. This will not only entertain your kids (hopefully), but also shine some daylight into the camper. That will surely make it even more enjoyable. However, please check the state laws on riding in the travel trailer while on the road. While it’s prohibited in some states, others permit it, as long as there are appropriate safety precautions in place. 9. How Big Is Your Current Vehicle? You can buy the biggest, most luxurious travel trailer there is. But if you’ve only got a tiny smart car to tow it around, you won’t get far. Before spending any money, figure out how much weight you have to play around with. Keep in mind that you’re already packing the car with luggage and passengers. Make sure that your vehicle can carry the load. 10. What Is Your Ideal Travel Trailer Lifestyle? 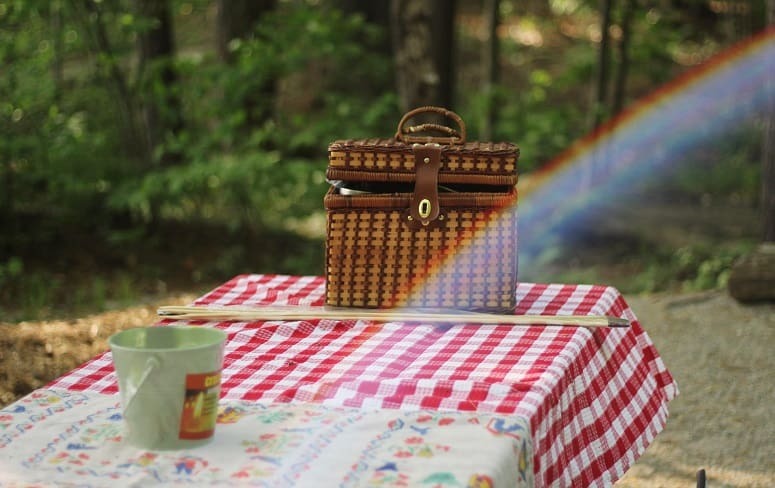 If you are new to the camping game, sit down with your family and have a chat about your new lifestyle. How many times a year will you travel? Do want luxury on wheels or are you picturing a more rustic holiday living space? These are essential questions to ask yourself, especially when you’re bringing children along on the journey. For travel trailers, there are loads of choices. Some are simple pop-outs, while others are a hotel on wheels. Consider the points mentioned earlier and the questions asked above. Be honest with each other. A travel trailer is an investment that will likely stay with you for the next couple of years at least. Teardrop travel trailers are usually smaller and lighter. Their frames are teardrop-shaped, which gives them an almost vintage look. Because they are lightweight, they’re easy to tow with many cars. On the inside, they are generally very basic. They provide the necessities and nothing more, due to the limited space. Some do have a small kitchen and dining feature, but rarely a bathroom. Still, if you have a small family and love spending time together, this is a great option. They are simple to hitch and unhitch, and can park almost anywhere. Just park on an official site where bathrooms are available. These are usually also a more budget-friendly option. Of course, depending on whether you buy it new or used, prices range from $4,500 to $20,000. Expandable trailers are compact trailers with fold out or slide out options. The trailer itself can extend either horizontally or vertically to provide some extra space for you on your trip. This could be either a living or sleeping area, sometimes both, once you’ve reached your destination. This type is an excellent option if you’re a family who doesn’t want an enormous camper to tow around. Some of these expandable trailers can even increase three times their size! Amazing right? Unlike most teardrop trailers, you can easily deck out expandables with all the luxury you need. Usually, it’s only the sleeping quarters that require expanding. The body itself, or main living area, of the trailer, stays the same. Pop-ups are very similar to the expandable trailers. They are, however, a little more compact. Much like the teardrop, it provides what you need, plus a bit extra. Once at your destination, the pop-out will extend up and out. Here it provides you with sleeping, dining, and eating areas. Now I know we want to fit a family in the trailer, but there are toy haulers that include living spaces. Some even come with slideout options as well. It’s basically a conventional travel trailer with all the comforts of home. But, behind the last living area wall, there’s room for any motorized toy you decided to bring. This might be the option for you, especially if you have older kids. Or if you are a kid at heart and just couldn’t leave your dirt bike at home. Fifth wheel travel trailers let you travel cross-country without compromising much of the comforts of home. These are usually the choice for most full-time campers. These trailers are generally larger—thus providing ample living space and amenities. They have a gooseneck design with a fifth wheel at the front, making for a more stable camper. You can easily fit a growing family in these trailers. However, because a fifth wheel trailer is larger and therefore heavier, you’ll need a big car or an SUV to tow it. Some good driving and parking skills are also required. Investing in a travel trailer for you and your family is an excellent way to save significant cash on future holidays. It will also create loving memories that your children will cherish forever. Every family is different, and we all have our unique preferences and goals in mind. Therefore it’s important to consider all the options and weigh in on which pointers you feel are essential for your new trailer. 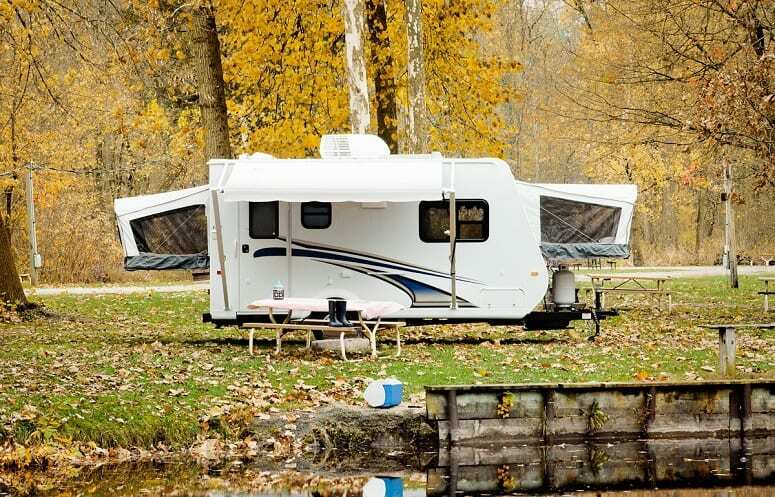 What amenities do you feel are necessary to include in your new family trailer? Please let us know in the comments below. And if you liked our little guide, feel free to share it.